Quarterback Pat Kehoe delivers a pass against Richmond. Kehoe passed for a career-high 291 yards against the Spiders. Delaware football Head Coach Danny Rocco and Elon Phoenix Head Coach Curt Cignetti were hired to their posts 17 days apart in 2016. Rocco, hired on Dec. 14, came to Delaware experienced and proven as a head coach in the CAA, having led Richmond to the playoffs in three of his five seasons there. Cignetti, having held just one head coaching job at Indiana University of Pennsylvania, a Division II school, was a less touted option. But in the 22 months since, Rocco’s program has only enjoyed a modicum of the success earned by the Phoenix, who enter this weekend’s matchup against Delaware on a wave of momentum following a road upset win against previously No. 2-ranked James Madison. If things played out differently that December, however, Rocco and Cignetti could have been on the same sideline this weekend, both in Delaware blue and gold. “To be quite frank, I contacted him to see if he’d be interested in coming here with me to run the offense,” Rocco revealed Monday at his weekly press conference. Cignetti earned CAA Coach of the Year honors in his first season with Elon after piloting an expeditious turnaround. The Phoenix made the playoffs, finishing the regular season 8-3 overall and 6-2 in conference play, after posting a combined seven wins (and 27 losses) in their first three seasons in the CAA. The 27-24 win against James Madison ended the Dukes’ record streak of 20 consecutive regular season CAA wins and their FCS-best 19-game home winning streak. It vaulted the Phoenix (4-1, 2-0) from No. 10 to No. 5 in the STATS FCS Top 25 national poll, Elon’s highest ranking since 2008. John Garrett, Rocco’s offensive coordinator at Richmond in 2016, accepted a head coaching position at Lafayette College a week after Rocco’s departure. Rocco eventually brought on Matt Simon to run the offense, a coach of 35 years who coached running backs for six seasons at the University of Buffalo before coming to Delaware. Head Coach Danny Rocco patrols the sidelines at Delaware Stadium in Delaware’s third game of the season against Cornell. Rocco knew Cignetti long before they connected in the 2016 offseason. Their families were acquainted when Rocco and Cignetti were young as their fathers crossed paths as coaches in the Western Pennsylvania and West Virginia area. When Rocco graduated high school, he visited West Virginia, who was coached by Frank Cignetti Sr., Curt’s dad. Curt Cignetti coached for six seasons at IUP after serving as a position coach at Pittsburgh (1993-1999), NC State (2000-2006) and Alabama (2007-2010). Cignetti jumped on the opportunity at Elon, wanting to get back to the talent-rich North Carolina region. “I thought it was a good coaching opportunity,” Cignetti said. “They were down record wise, played in a tough conference, but I thought you go in there with a plan, you could improve it. All of a sudden, the school of only 6,000 students is being discussed as not only one of the CAA’s best teams but as one of the best teams in the nation. 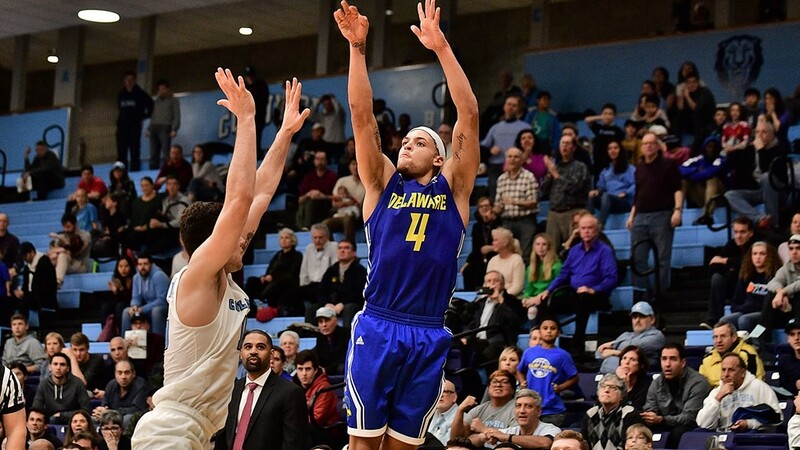 Delaware (3-2, 1-1), in contrast, has taken the scenic route back to national prominence. 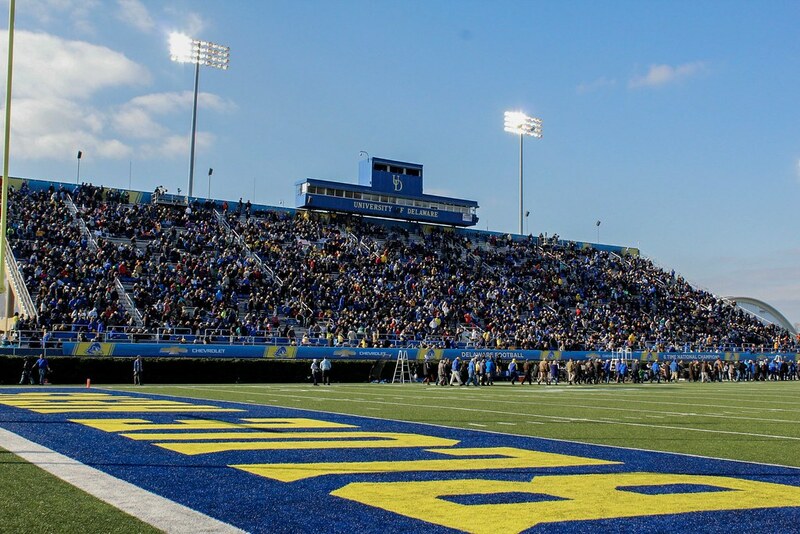 As Blue Hens fans are well-aware, Delaware has not made the playoffs since 2010, despite being one of the largest and best-attended FCS programs. It’s the longest such drought in school history. The Blue Hens recognize this weekend’s challenge, the first meeting between Delaware and Elon since 2015, as an opportunity to prove they belong on the national stage. “It just added to the hype,” senior tight end Charles Scarff said about Elon’s upset win. Delaware, in its own right, is coming off a dominant win — a 43-28 drubbing of Richmond. Delaware made six takeaways, which doubled their season total entering the game. It was a point of emphasis for the Blue Hens during their open date, which preceded the trip to Richmond. Despite the staggering turnover number, Delaware displayed many vulnerabilities defensively Saturday. 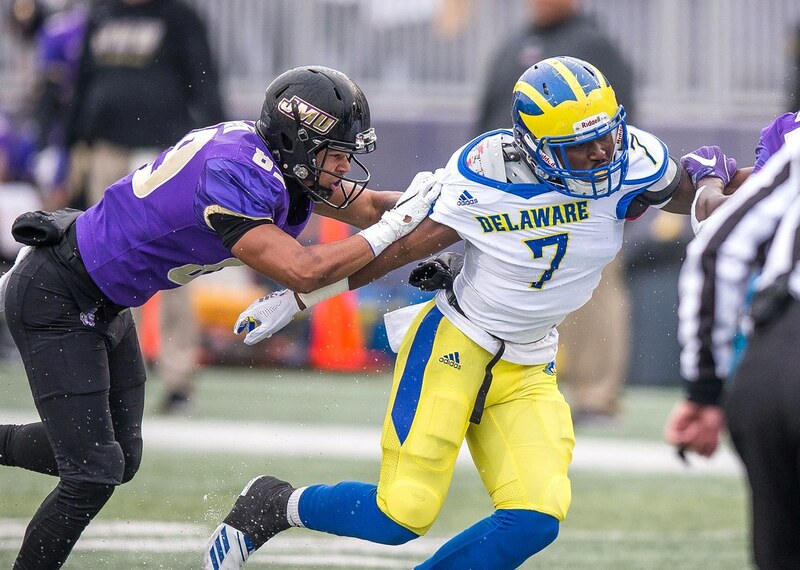 The Blue Hens allowed a season-high 608 total yards, 489 of which came through the air. “We probably played average at best in my opinion,” redshirt senior linebacker Charles Bell said. Redshirt sophomore cornerback Nijuel Hill was repeatedly attacked deep and yielded touchdown passes of 80, 57 and 37 yards, but Rocco said the issues were widespread among the defensive unit. Nijuel Hill has started every game at cornerback. His first career start came against Virginia Tech in the second game of the 2017 season. The Delaware defense awaits CAA-leading rusher Malcolm Summers, who posted a season-high 186 rushing yards on 20 carries against James Madison. His career-long 59-yard touchdown run in the fourth quarter helped seal the win. “He’s big, physical and still elusive and fast,” Rocco said of Summers. De’Sean McNair, who started five games when Summers was injured late last season, provides an able complement. Elon leads the CAA in rushing, averaging 219.6 yards per game on the ground. Delaware’s defense ranks fourth against the rush this season, allowing 118.4 rushing yards per game. The Blue Hens completed three passes of 45 yards or longer against the Spiders. It was the first time in six years that Delaware had multiple passes of that distance. Quarterback Pat Kehoe finished the day with a career-high 291 passing yards on 11 completions. The performance continued a trend of Delaware taking advantage when opposing teams stack the box to defend the run, by taking shots deep down the field. “They’re extremely well-coached and they’re physical and they’re fundamental and they’re making explosive plays on offense right now and they’re creating a lot of turnovers and it’s going to be a difficult test,” Cignetti said. The ground game was largely silenced again, gaining just 90 yards on 37 rushes (2.4 yards per carry). Coming off the program-defining win against James Madison, Cignetti was quick to temper expectations. Going on the road after a close and emotional game, Elon is preparing against a letdown versus Delaware. “It probably happened a lot faster than a lot of people thought, but there is a lot of season left here too and we understand that,” Cignetti said. “I think we have the right kind of guys who understand that too. Rocco recognized the significance of the opportunity against the Phoenix and his once-prospective coordinator. Delaware fans cheer on the Blue Hens at Delaware Stadium. 1. When asked specifically about Hill’s play, Rocco said “we have options,” then offered the following assessment. K.C. Hinton will likely start opposite Hill in place of Tenny Adewusi, who has to sit out the first half after being ejected during a second half scuffle against Richmond. The safeties Rocco referenced are seniors Malcolm Brown and Nasir Adderley. Brown started at cornerback in each of the past two seasons. Adderley moved to safety before last season, after playing cornerback, on the outside and in the slot, during the first two years of his career. If one of them moves to cornerback, linebacker Ray Jones could slide back to safety, where he played in his first three seasons. Jones took a few snaps at safety against North Dakota State when Brown moved to cornerback and Delaware introduced a four down lineman formation. Hinton can also play multiple positions in the secondary. 2. Rocco praised James Madison for its sustained run of success. The Dukes have long served as the model for Delaware and teams throughout the CAA. The loss shouldn’t affect their national title hopes. They rank tied for sixth in the latest top 25, a spot behind Elon. 3. The CAA continues to get love in the top 25 poll. At least six teams from the CAA have made the poll every week this season. Nine different teams have made an appearance: Elon, James Madison, Stony Brook, Rhode Island, Towson, Maine, Villanova, New Hampshire and Delaware. This week Delaware was in the others receiving votes category. The Blue Hens first made the poll last season on Oct. 23 2017, after their 42-35 overtime win against Richmond. A win against Elon would certainly put Delaware inside the top 25 for the first time since the preseason.